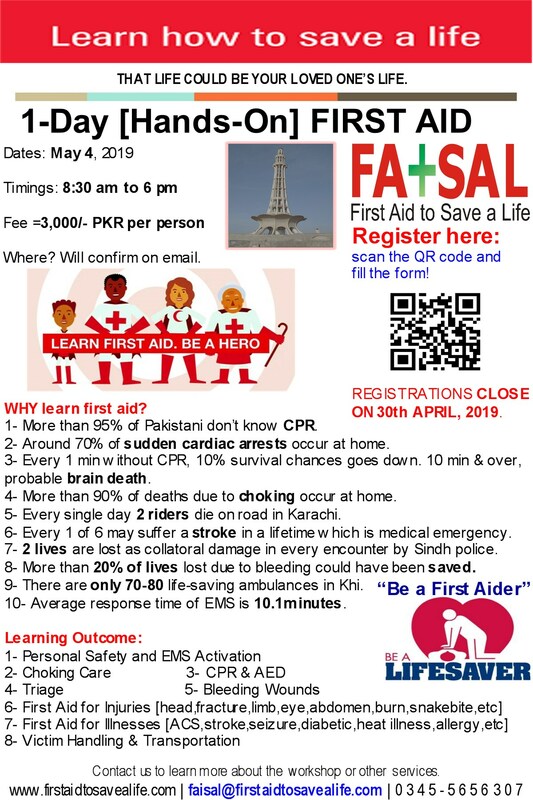 First Aid to Save a Life (FATSAL) Pakistan is pleased to announce 1-day “CPR, AED & First Aid” Accredited Certification Course in Islamabad on February 07, 2016. This course will help students to gain the knowledge skills, and confidence necessary to manage a medical emergency using CPR and first aid until more advanced help is available. Also, participants will get real life experience to use Automated External Defibrillator (AED). 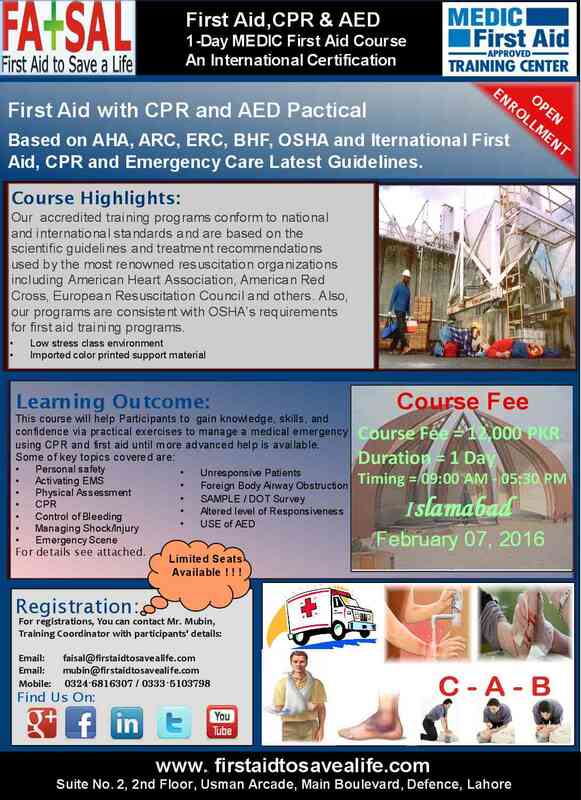 This entry was posted in 1-Day Training Programs, Advanced First Aid, Basic First Aid and tagged 1-Day Training Programs, 2014 training course, 2015, 2015 trainings, accredited first aid and cpr trainings, accredited first aid trainings in pakistan, accredited training program, advance first aid, Advanced First Aid, AED, aed training, aed training programs, aed trainings in pakistan, AEDs, AHA First Aid Training Courses, American heart association, anti snake venom vials and pressure bandage, anti-snake venom vials, ARC First Aid Training Courses, automated external defibrillator, basic first aid, basic life saving skills, Cardio Pulmonary Resuscitation, control of bleeding in snakebites, conventional CPR training vs online CPR class, courses, CPR, cpr and aed, CPR and AED for Adults, cpr training, cpr trainings in lahore, defibtech aed, discount offers, discount offers on trainings, emergency care and first aid, emergency first aid, first aid, first aid and cpr, First Aid CPR and AED, First Aid CPR and AED Trainings in Faisalabad, First Aid CPR and AED Trainings in Gujrat, First Aid CPR and AED Trainings in Islamabad, first aid cpr and aed trainings in karachi, First Aid CPR and AED Trainings in Lahore, first aid cpr and aed trainings in multan, First Aid CPR and AED Trainings in Pakistan, First Aid CPR and AED Trainings in Punjab, first aid training, first aid training and floods, first aid training courses in hyderabad, First aid training courses in islamabad, first aid training courses in lahore, first aid training for fitness instructors, first aid training for fitness trainers, first aid training for gym instructors, first aid training for physical instructors, first aid training for physical trainers, first aid training for teachers, first aid training for teachers in Australia, first aid training for teachers in canada, first aid training for teachers in Gulf, first aid training for teachers in Kuwait, first aid training for teachers in Oman, first aid training for teachers in Saudia, first aid training for teachers in UAE, first aid training for teachers in USA, First Aid Training Programs and tagged 2014, first aid training providers, first aid trainings for free, first aid trainings in 2015, first aid trainings in islamabad, flood and first aid training, free first aid courses, free first aid trainings in islamabad, free first aid trainings in Karachi, free first aid trainings in Lahore, Hands-Only CPR, hse courses in islamabad, HSE courses in pakistan, hse training courses in islamabad, hse training courses in karachi, hse training courses in lahore, international aed training courses, international cpr courses, international first aid courses, international first aid cpr aed training courses, international first aid training center in Afghanistan, international first aid training center in bangladesh, international first aid training center in Bhutan, international first aid training center in China, international first aid training center in India, international first aid training center in Iran, international first aid training center in Maldives, international first aid training center in Nepal, international first aid training center in pakistan, international first aid training center in Saudia, international first aid training center in UAE, international first aid training centers in asia, international first aid training centre in pakistan, international first aid-cpr-aed courses, International Training Certification Course, islamabad, Karachi, Lahore, latest aed guidelines, latest cpr guidelines, latest first aid guidelines, Latest first aid training guidelines, medic first aid trainings, new courses launched in 2014, occupational safety training institute pakistan, online CPR training, Pakistan, practical snakebite first aid training, practical snakebite first aid training in Pakistan, snakebite prevention and floods, sudden cardiac arrest, training calendar for 2014, training course, training for teachers in canada, training program, trainings, trainings in 2015. Bookmark the permalink.